As the arbiters’ of wine lists, the restaurant patron should embrace their knowledge, skills and talent as they are hopelessly and passionately obsessed with wine and will take you on journey of gastronomic enlightenment. And our new-age sommelier is no longer confined to fine dining and can be found in casual eateries, wine bars, gastro-pubs, winery restaurants, wine stores and you’ll even bump into an air-sommelier at 30,000ft these days. The Wandering Palate Sommelier of the Year (Asia) is not arrived at by vinous gladiatorial competition nor through academic prowess; rather it is awarded to a sommelier that has displayed exceptional communication skills and talent in engaging restaurant patrons – there is no higher qualification than people skills – delivering in what is the most vital role of a sommelier, outstanding wine service and ensuring the customers has a memorable wine and food experience. Further criteria of this award looks for uniqueness in the wine list presentation or program that the sommelier is involved with and a high degree of competence in the pairing of wine to food in challenging cuisines or dishes. This award also recognize the future potential of the recipient; that they on a trajectory of further learning and have a promising career ahead of them in the hospitality or wine industry. This year’s recipient is Miss Charuk Chochan who is the Resort Sommelier at the Conrad Koh Samui, Thailand, www.conradkohsamui.com. Having worked with Khun Cha I was most impressed with her ability to communicate with many different nationalities and the multitudinous of cultural tastes and demands that comes with the international patronage of a tropical resort. She has championed a dynamic wine selection and unique approach to matching wine to contemporary Thai Cuisine in their flagship restaurant, Jahn; furthermore having a multitude of wines by the glass perfectly tailored to the different cuisines and environments – from alfresco, poolside dinning to Pan-Asian all-day grazing – achieving an palpable sense of wine culture and raising the standards of wine service in the region. Khun Cha has 8 years of experience working in the luxury hotel industry and discovered her passion for wine when working in an Italian restaurant. By attending training courses in Hua Hin and Pattaya as well as extensive self study she translated her passion into knowledge – the promotion to wine guru at Anantara Samui followed shortly. In September 2008 she won her first title, being “Champion of Southern wine butler”, a competition in which sommeliers from several Southern provinces participated. Two top 20 places in the Thailand Best Sommelier competitions 2009 and 2010 followed, until she won the title of first runner up of Thailand Best Sommelier in June 2011, shortly after she had joined Conrad Koh Samui. 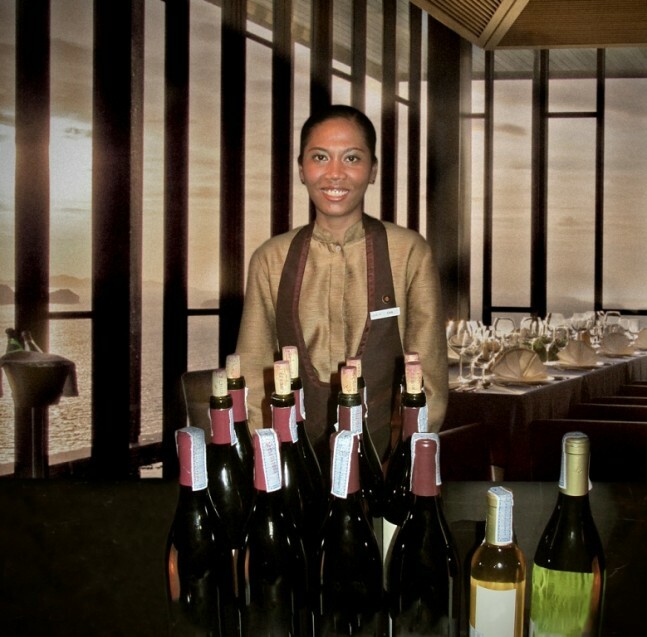 In her role of Resort Sommelier Khun Cha directs wine sales and trains the service team, along with the continuous fine tuning of the resort’s wine list. She is on-hand throughout the resort advising guests on wine selections and also hosts wine classes and wine dinners in the Conrad’s private wine cellar, as well as directing on-going visiting winemaker events. I would like to acknowledge the generous and altruistic support of these vineyards, with special mention to Schubert Vineyard for their efforts in putting together the itinerary for Khun Cha. All of these vineyards have the vision of supporting the emerging wine market of Thailand; perhaps overshadowed by the bourgeoning growth in the China market however, the ASEAN region is a strategic growth area for wine consumption and not only because of the increasing wealth of the region but also the fact there are more resorts and hotels in South East Asia than anywhere else in the world. It is also very evident that the pure-fruited and approachable wines of New Zealand are well-suited to many aspects of Thai cuisine to which there is a fast-growing popularity and strong following for these wines. Thailand is indeed already a sophisticated wine market and in my workings there I have been amazed at the availability of top wine producers and the level of genuine enthusiasm, professionalism and due care in transport and storage conditions by many wine merchants there. In particular I would like to commend the dynamic portfolios and professionalism of Vanichwathana (Bangkok) 66-2221-5354 and Wine Gallery (Bangkok) 66-2662-1345. I would also like to acknowledge the cooperation and support of the Conrad Koh Samui management in making it possible for Khun Cha to pursue further wine knowledge and hands-on vineyard experiences, with a special mention to Food & Beverage Manager, Roman Nieschlag, the most humblest gentleman behind the scenes orchestrating all these elements. Ladies and Gentlemen, please put together your hands in applause for our Sommelier of the Year Asia, Khun Cha. And I can highly recommend you visit her at the Conrad Koh Samui for an all-round gourmet experience and horizontal meditation!